So I sat down to blog again and realised with a back to reality horror that the last time I blogged was NOVEMBER!!!! In my defense a whole heap of stuff has happened since November. I started an amazing new job that is keeping me busy and, on the odd occasion, away from home – and it’s hard to blog from a hotel room. I also started a new diet. Some foodies have all the luck and are able to eat tons of yummies and still stay slim. I am unfortunately not one of those foodies. 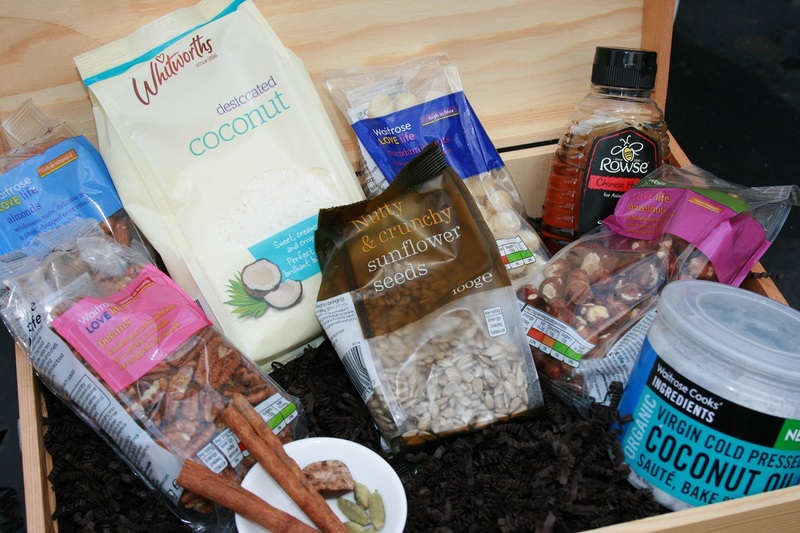 On a trip back to South Africa earlier this year I was introduced to Tim Noakes’s Real Meal Revolution – which is in essence a low carb, high fat diet – or as he would prefer – a low carb, high fat way of life. The verdict – I’m hooked. Weight has been coming off at a nice and steady pace, I don’t feel hungry or for that matter that I’m dieting AND I don’t miss carbs nearly as much as I thought I would. I have had to make changes to the way I cook and that hampered the blogging, but I’ve had a few successes and I’m back on track. One thing that has been difficult has been for me is breakfasts. Not weekend breakfasts when you have ample time to cook omelets and fry-ups and frittatas, but weekday breakfasts when you’re rushing out the door to beat the traffic. 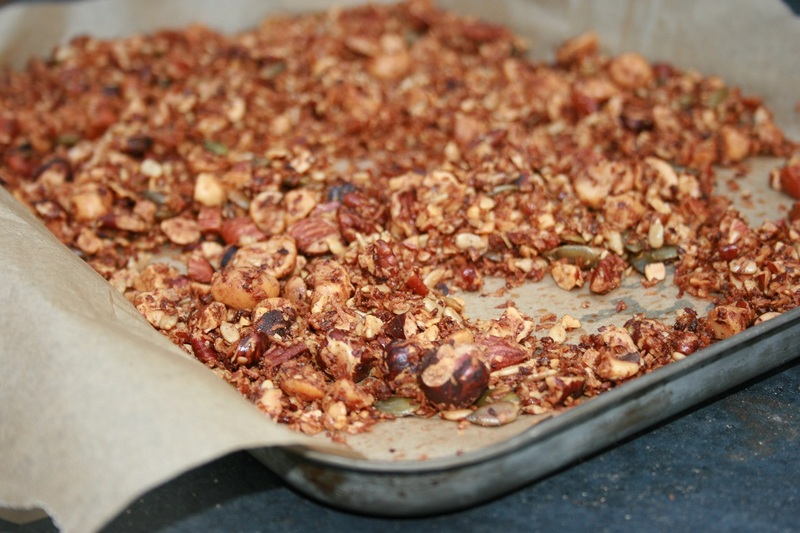 Yogurt works, but lets face it, it can be a bit tedious, so I’ve been playing around with carb free granola and I’ve finally found one I really like. 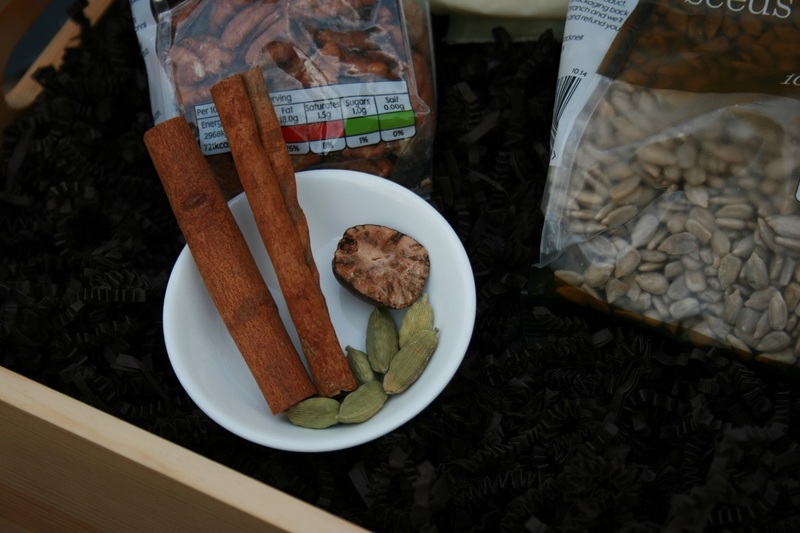 A Note on the Spicing – you can use whatever spicing you happen to enjoy. I’ve used cinnamon, nutmeg, ginger and cardamom. I also like mine quite flavourful so I’ve used 2 tsp of cinnamon, 1 tsp of nutmeg and 1 tsp of ginger and then the seeds from 6 cardamom pods. Preheat the oven to 160 °C and line two baking sheets with parchment paper. 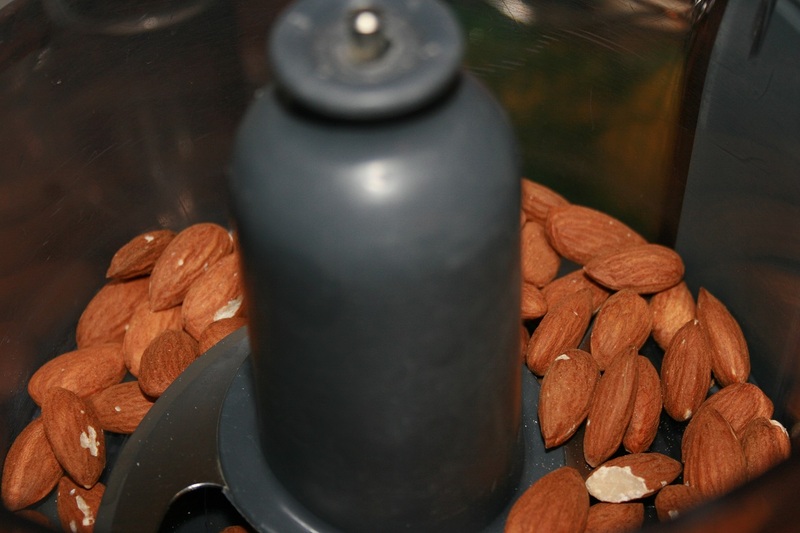 Then process your nuts (not the seeds or the coconut) briefly until they are coarsely chopped. 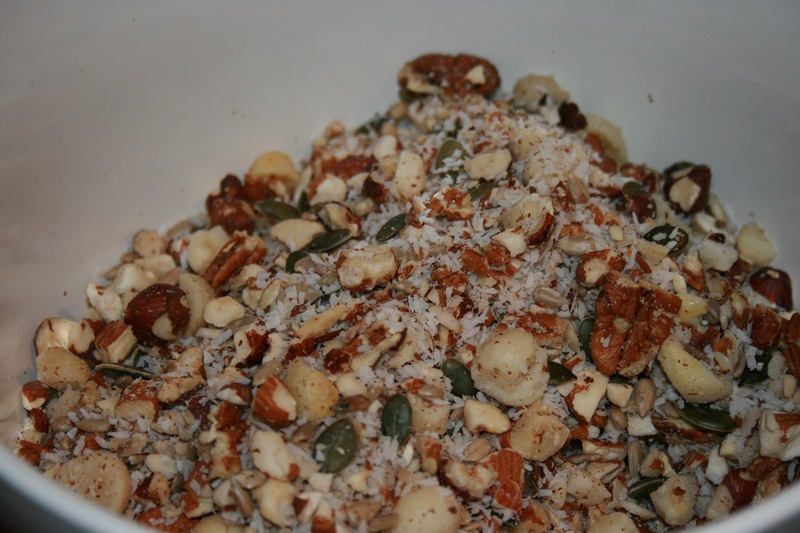 Add the coarsely chopped nuts, seeds and coconut to a large bowl and mix well. 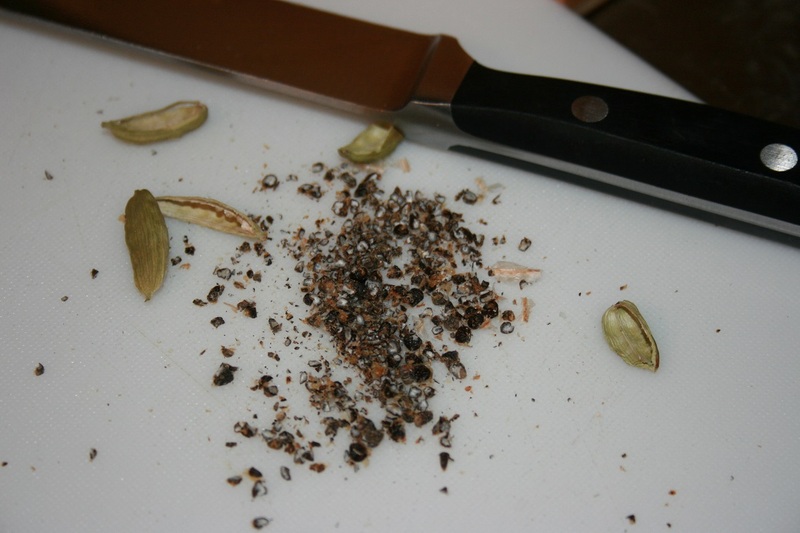 If you’re using fresh spices – and if you’re not, give it a try as the flavours are SOOOOO much better – chop, grate and grind your spices. In a large pan (I used my wok) add the coconut oil, spices and the honey and heat over a low heat until the coconut oil has melted and the honey is runny. 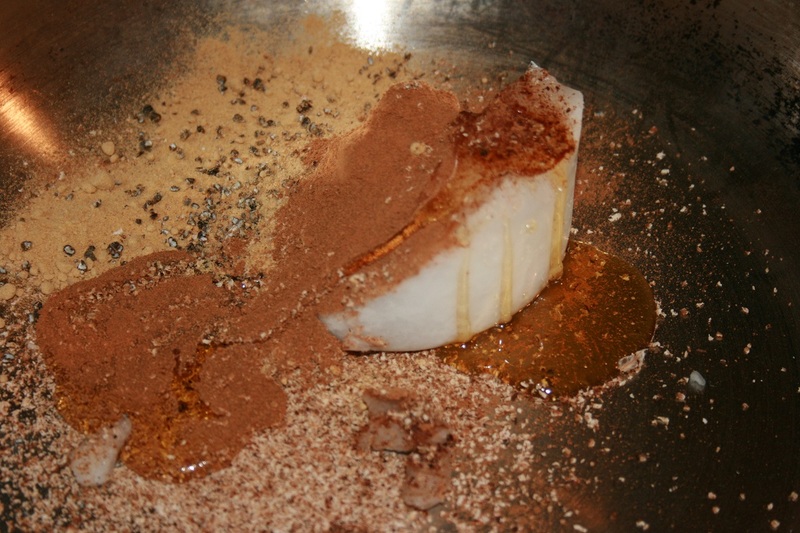 Add the nut mixture and stir to coat it evenly in the oil and spice mix. 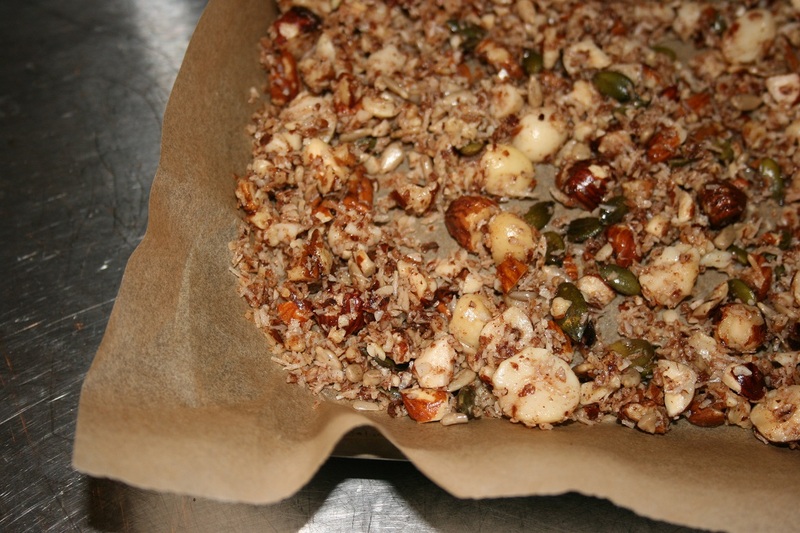 Spread the granola mix evenly out over the two trays and place them in the oven for 20-30 minutes until the nuts are golden and toasty, but keep an eye on them to make sure they don’t burn as this will make your granola quite bitter. 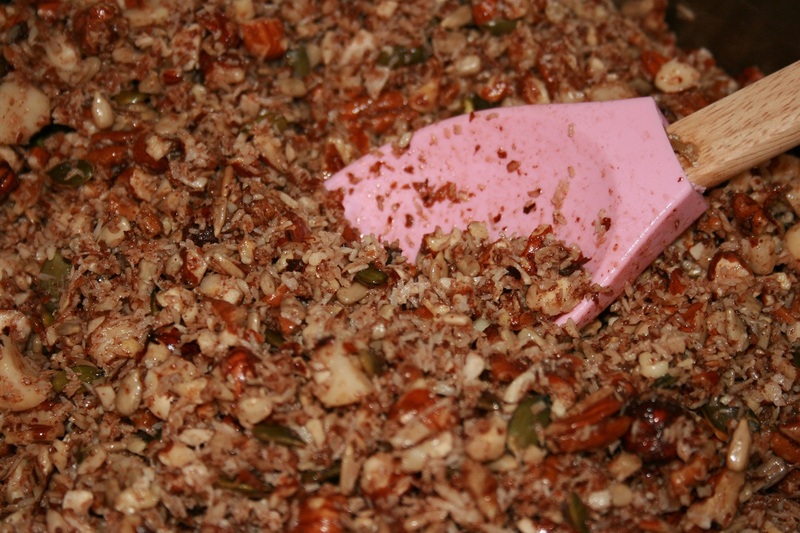 Leave the mix to cool to room temperature and store in an airtight container. 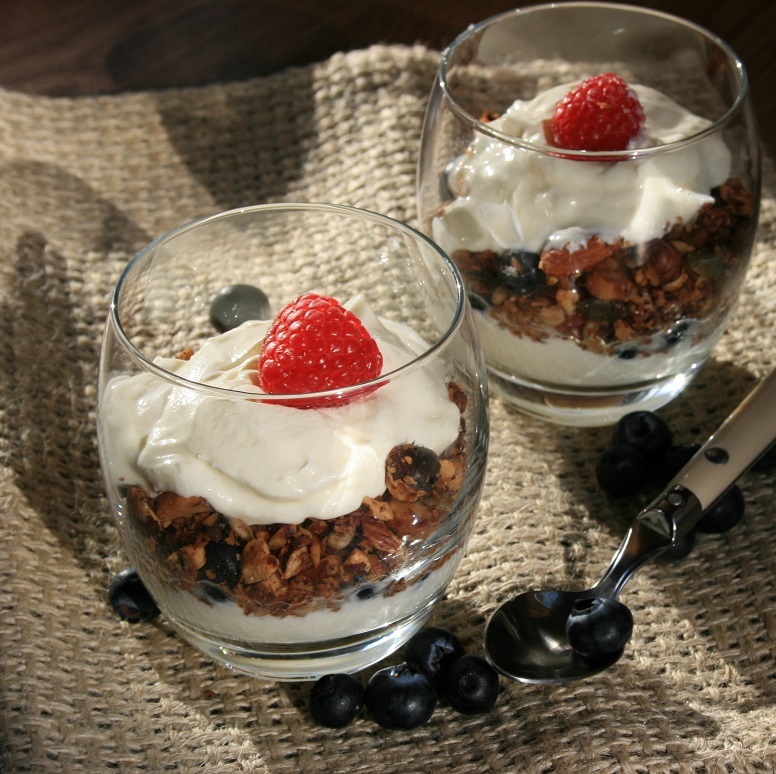 Add a dollop of yogurt, a sprinkle of blueberries and enjoy! The BH and I have had a bit of a trying year. We’ve both changed jobs AND we’ve bought a house. Add to this a missing camera charger and you have a very guilty me apologising for the HUGE hiatus in my blogging. That said this weekend rolled around and to both of our absolute surprise and wonder, there was nothing planned. I’m not going to lie, we were both more than a little shell shocked by this and for a while just stared at each other, not really sure what to do. Then, thankfully, sloth instinct kicked in and pancakes and old episodes of the X-Files were the order of the day. Now I must confess, I simply can’t resist the urge to mess with pancakes, these however are my current favourites. Melt the butter in a small sauce pan and allow it to cool. Then add the milk to the butter. Beat the eggs and add these along with the vanilla bean paste to the melted butter. You want to make sure the butter is cool and you add the milk before you add the eggs otherwise you’re going to be eating buttery, vanilla flavoured scrambled eggs, which I don’t think will taste as good as it sounds. 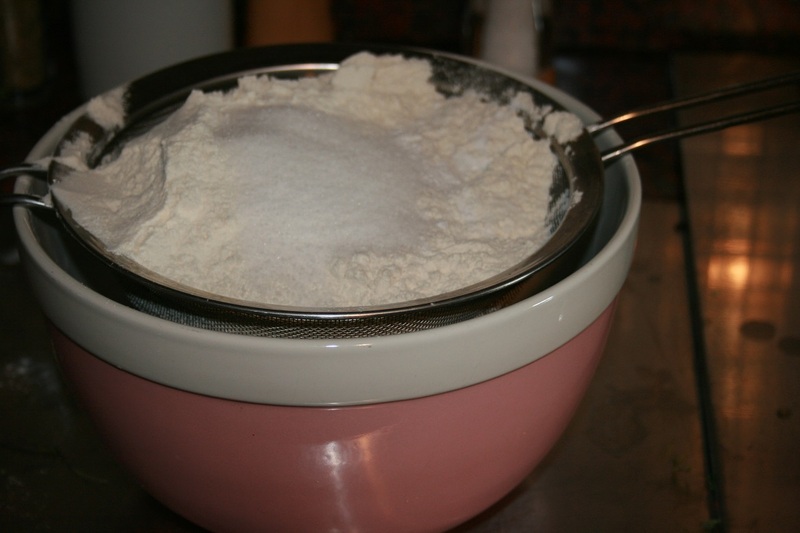 Sift together your flour, salt, baking powder and sugar (if you’re using it) in a large mixing bowl. Then slowly add the milk mixture to the flour mix and whisk until the mixture is smooth and lump free. 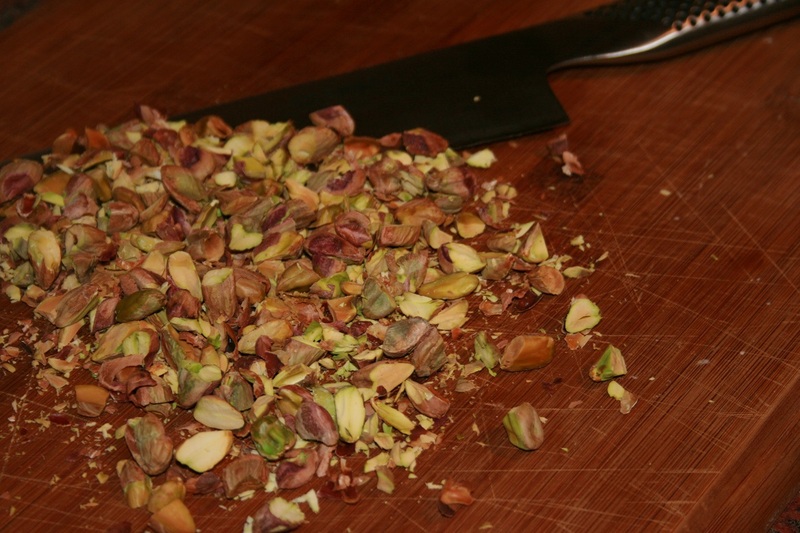 Roughly chop your pistachios and wash and dry your blueberries. Put these in two separate bowls next to your griddle or frying pan. 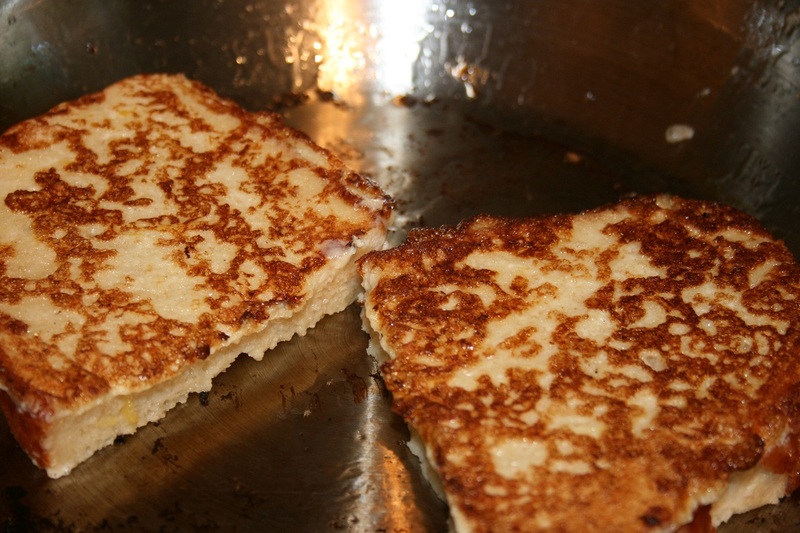 Heat your pan or griddle and using a paper towel, apply a thin layer of vegetable oil to the pan/griddle. 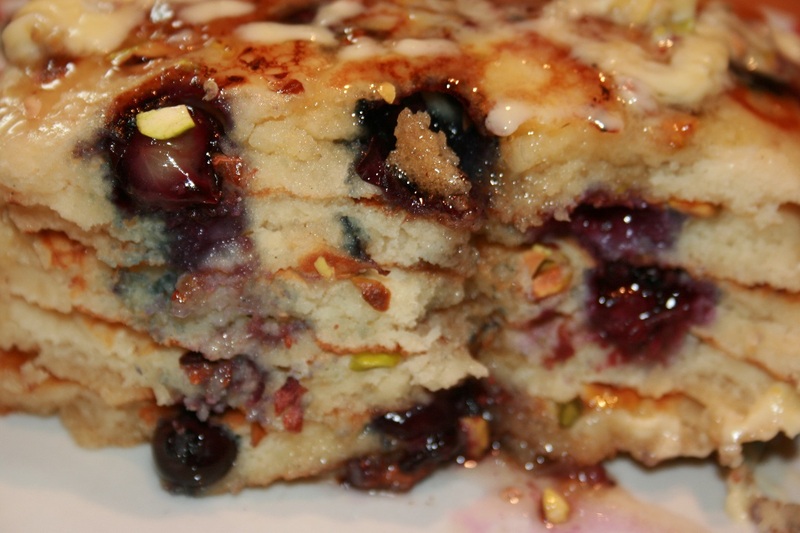 Using a soup ladle, spoon a circle of batter on to your griddle pan and then top with blueberries and pistachios. 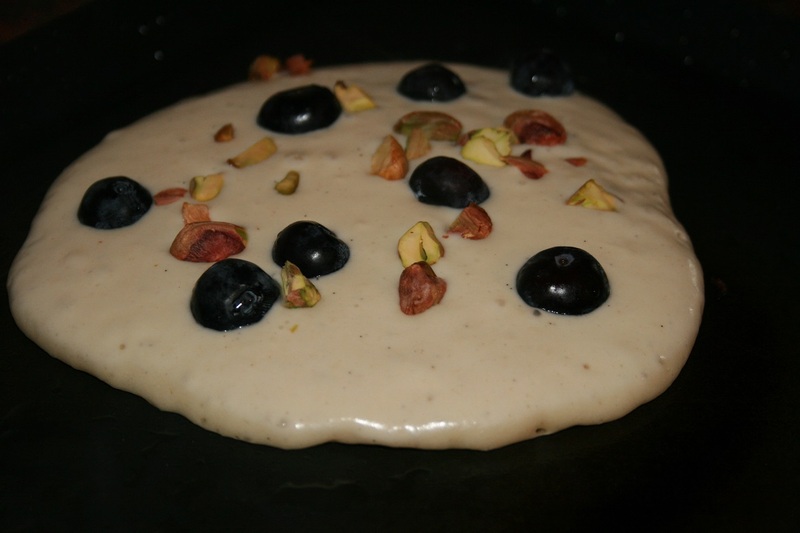 When the batter bubbles, turn your pancake over and cook on the underside. 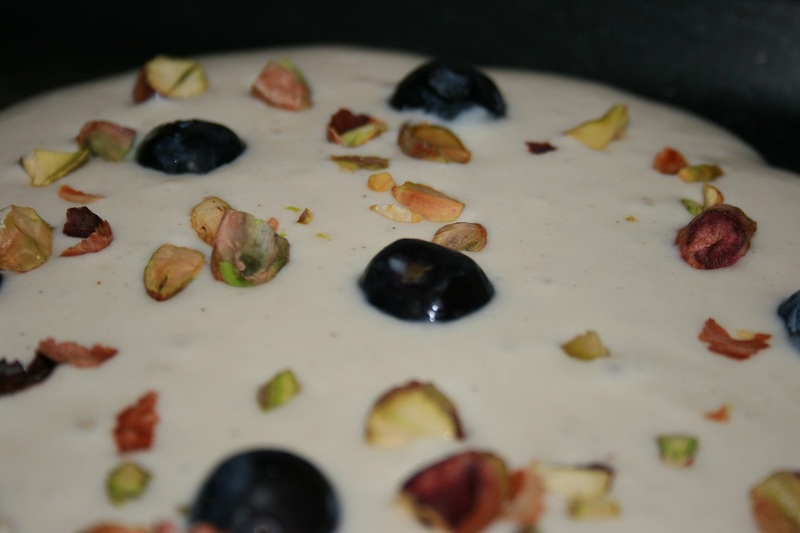 Sorry, I just love the colours of the pistachios on the batter, so you’re being subjected to another photograph. 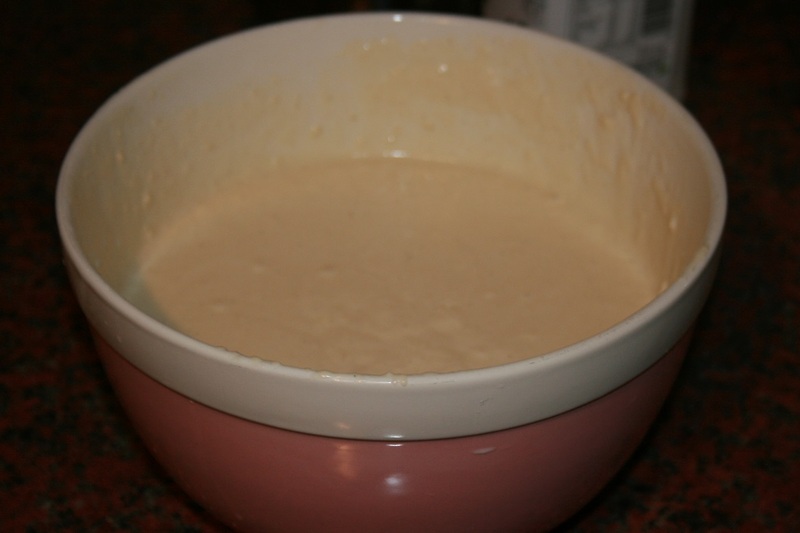 Place the pancake in a warming draw or oven on a low heat and repeat the process until you have used all the batter. 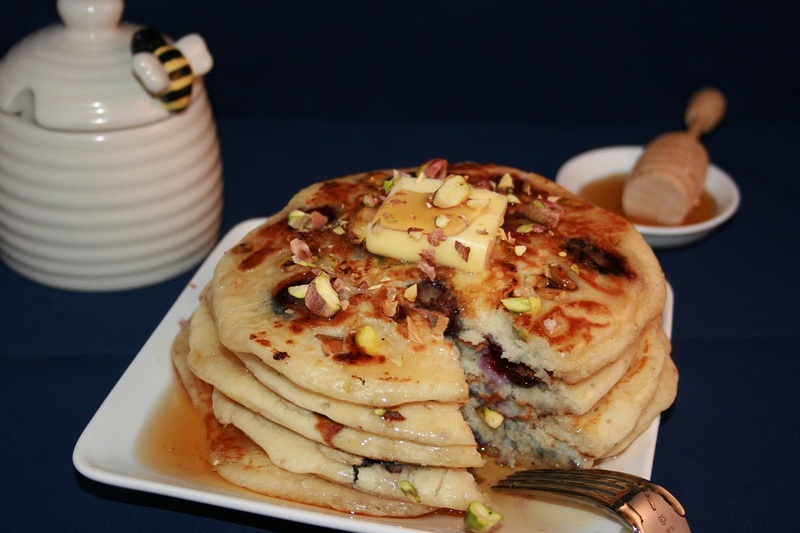 Drizzle your pancakes with honey, you can use any syrup that takes your fancy, but there is something about the pistachios and blueberries that just really works with honey, and enjoy. On some weekend mornings you wake up feeling a little more delicate than you should. We won’t go into any detail why, but your head is tender, loud noises hurt and for some unfathomable reason you are STARVING. On mornings like this you need coffee and you know your day is going to consist of trashy TV and sitting on the couch. Period. On mornings like this I NEED Mished Mash Potato, a dish that is greasy, salty, stodgy and amazingly restorative. There isn’t anything too technical with this recipe, but if your head can stand it, there is a bit of chopping. If you don’t think you can do in in the morning, do your chopping the night before (before you go out) and have everything ready to just pop in the oven. 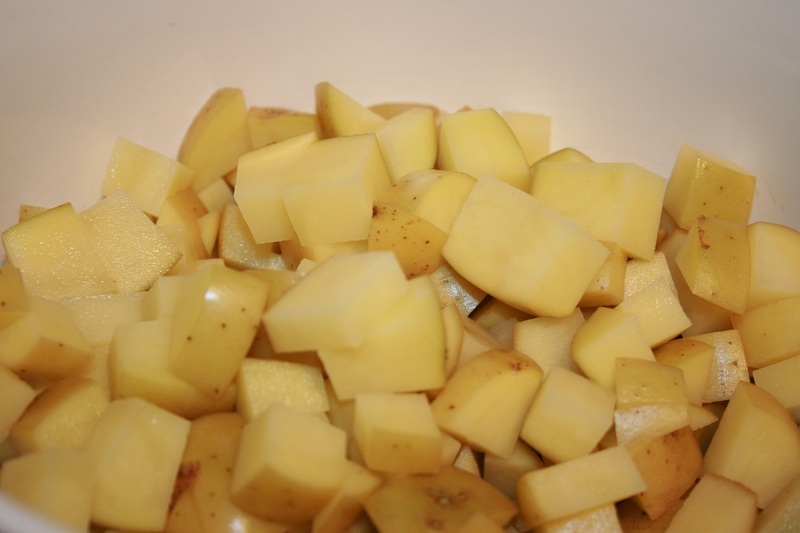 Preheat your oven to 200 °C and chop your potatoes, peel on, into about 1cm-ish cubes. Put the ruler away, this is not an exact science, besides you’re feeling delicate. 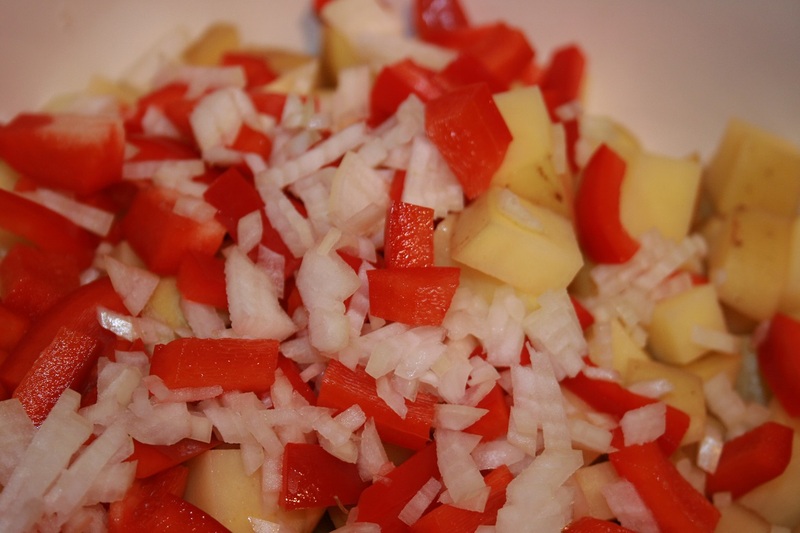 Very finely dice your onion and roughly chop your pepper into strips and combine with the potato. 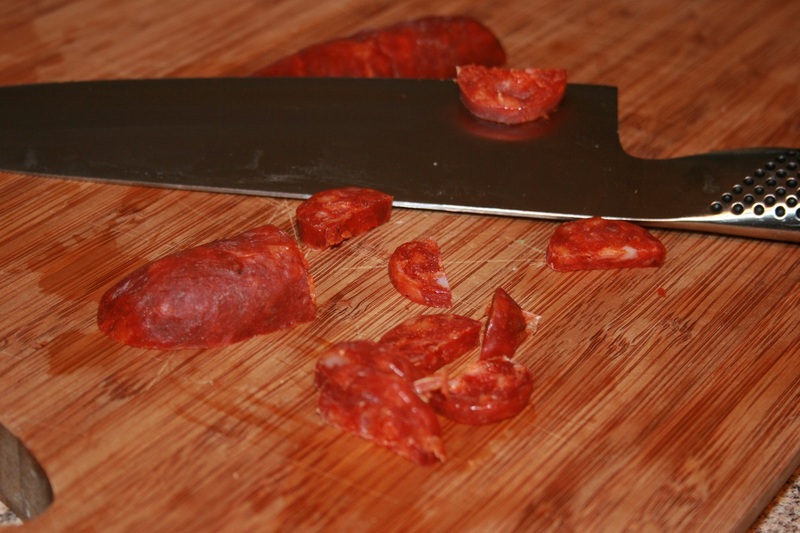 Slice each Chorizo in half and then thinly slice and do the same to the bacon. 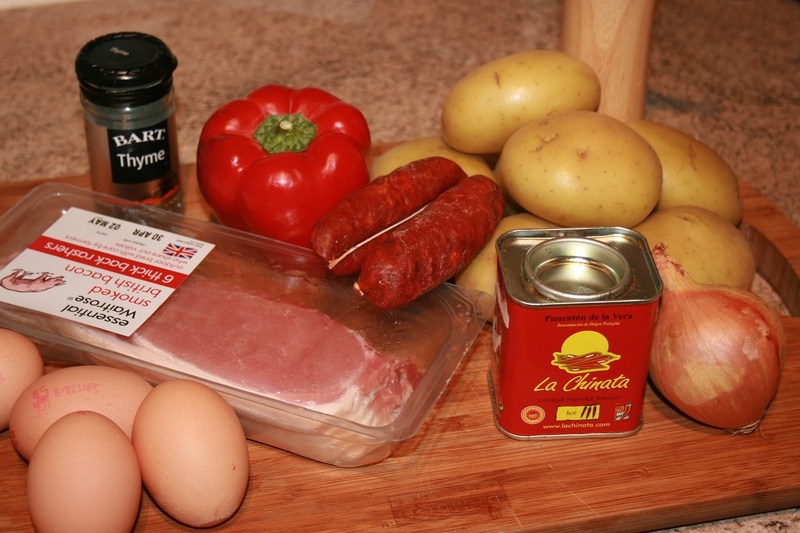 Mix the bacon and chorizo with the potatoes and add a tsp each of smoked paprika and dried thyme and add a good glug of olive oil and a grind of black pepper. And with all that chorizo and bacon, you don’t need to add any salt. 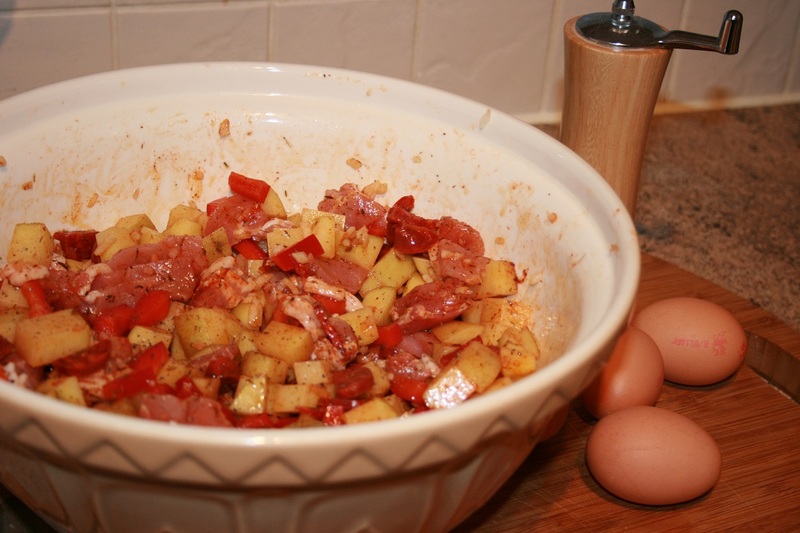 Place all the ingredients into a lined baking dish and bake for about forty minutes. 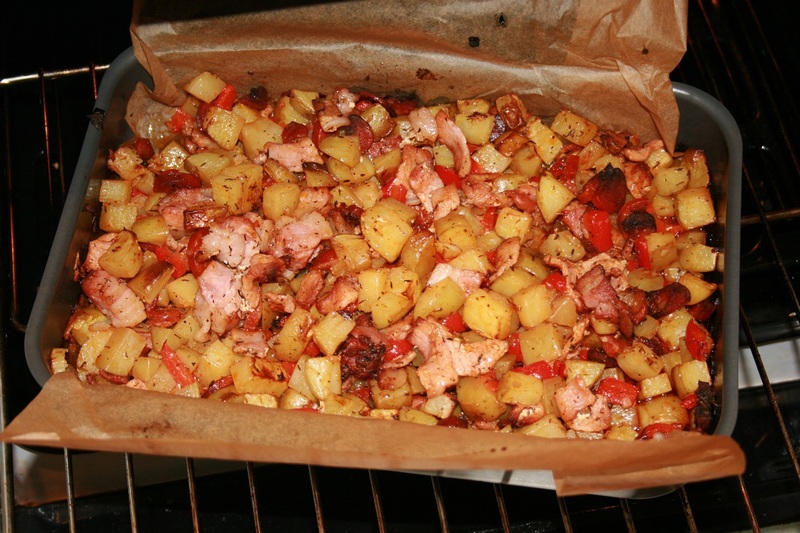 The potatoes should be soft and the bacon and choritzo nice and crispy. 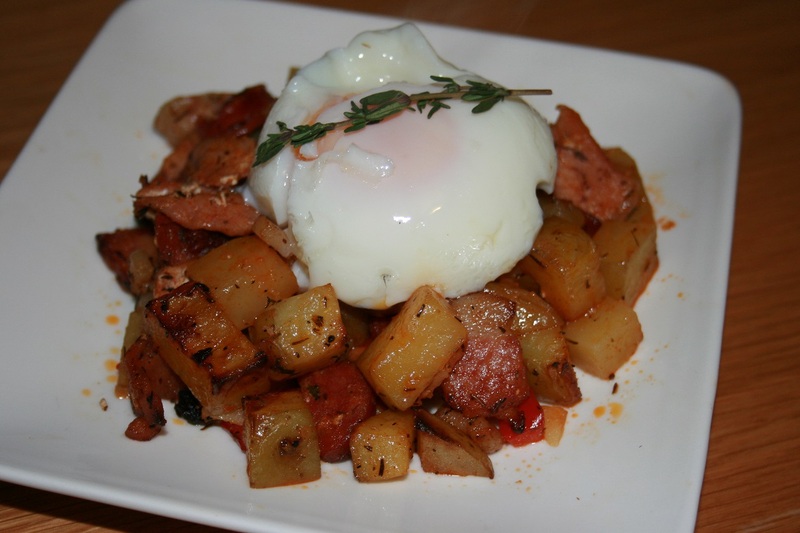 At the 35 minute mark or there abouts poach your eggs. Now trust me on this, even if you like your egg yolks hard, leave them on the soft side for this. 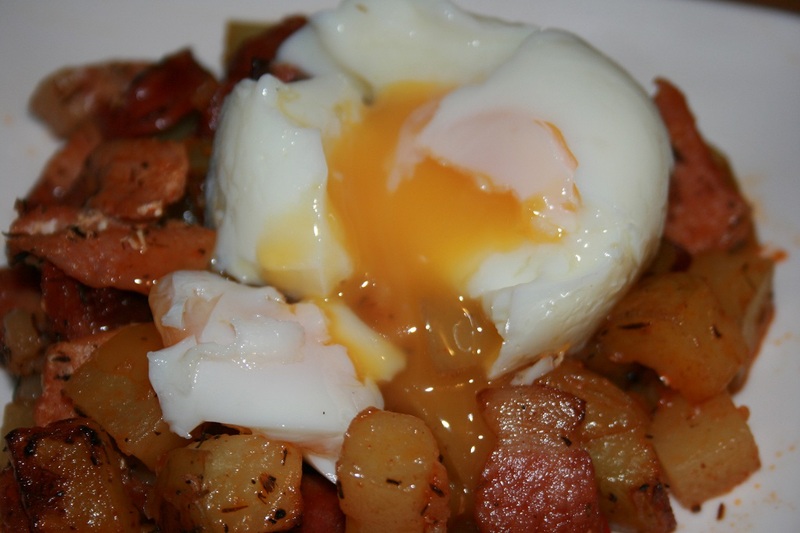 Once the eggs and the potatoes are done, make a nice pile of potato on a plate and top with that lovely, runny egg. Cut into your egg and let the yolk make an amazing sauce. Sit back and enjoy the laziest day ever. I like simple recipes when it comes to breakfast. Before coffee I’m not really able to give a complicated dish the attention it deserves. Heck, I’m not able to give anything the attention it deserves without caffeine. So uncomplicated wins hands down every time, besides there is nothing more satisfying than taking six or seven ingredients and turning them into something that makes your mouth water, even in an un-caffeinated state. 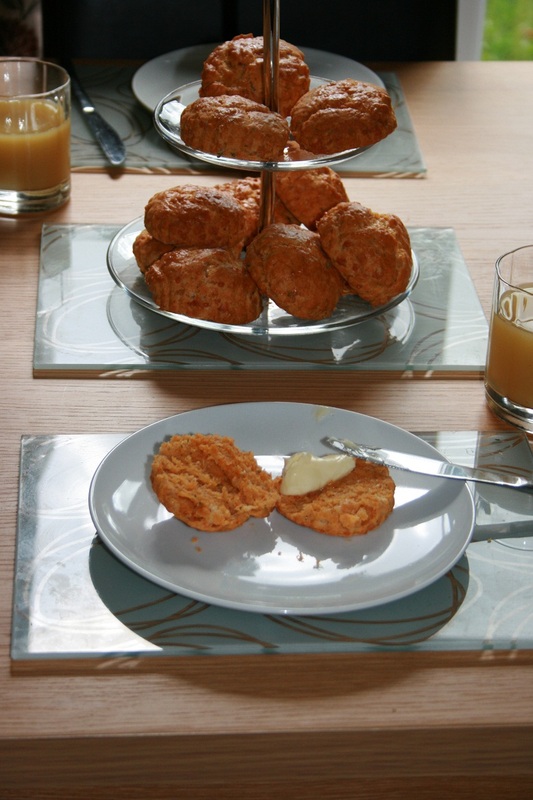 The BH’s family traditionally serve cheese scones as a weekend breakfast. A tradition I am more than happy to get behind. They take no time at all to make while still filling the house with the smell of baking. 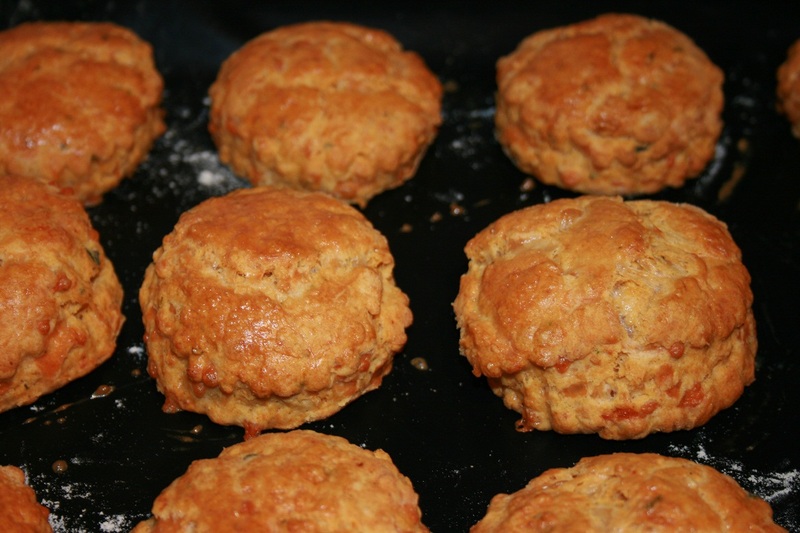 Now I suppose if we lived on the American side of the pond, these would be called biscuits, but I prefer the term scone. 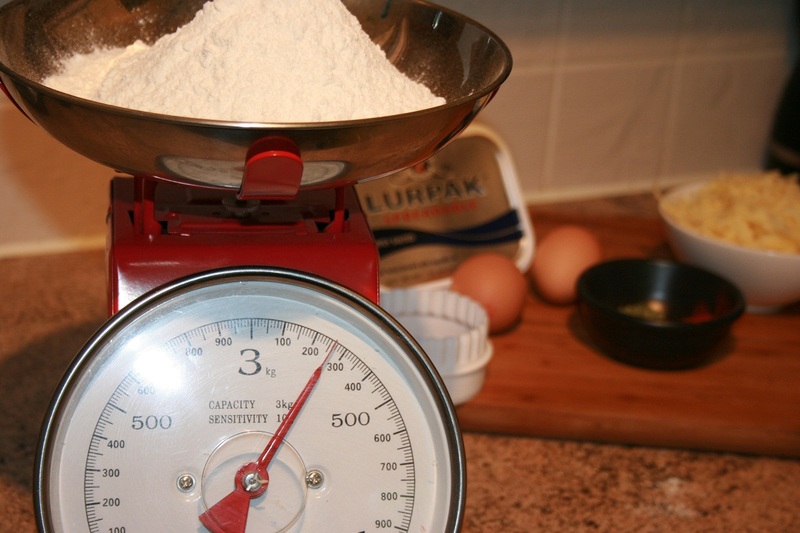 Preheat the oven to 180 ° C. Weigh out the flour and then add to a mixing bowl. I know I didn’t need to photograph this, but the BH bought me an AWESOME new scale and I wanted to show it off. 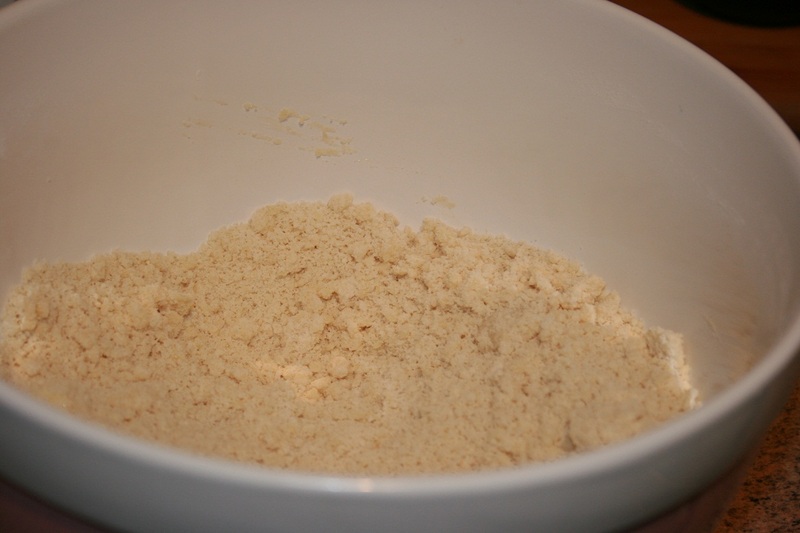 Add the butter to the flour and then mix using your hands until they resemble bread crumbs. 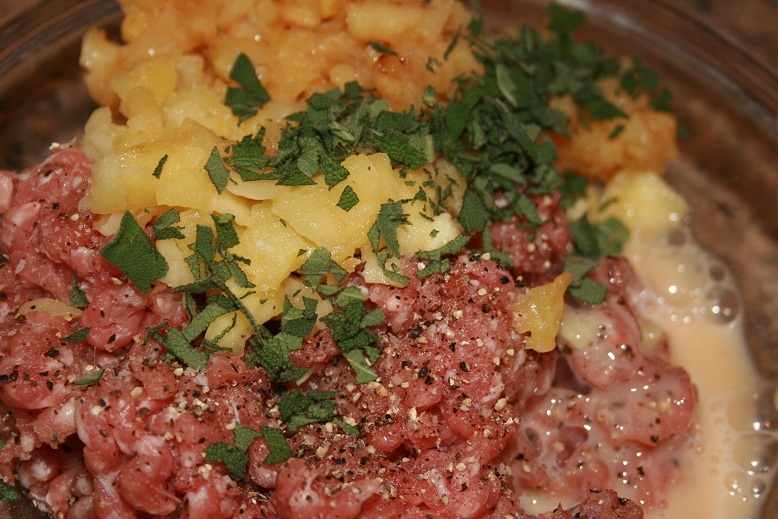 Add the cheese, paprika and herbs to the bowl and mix well until thoroughly combined. 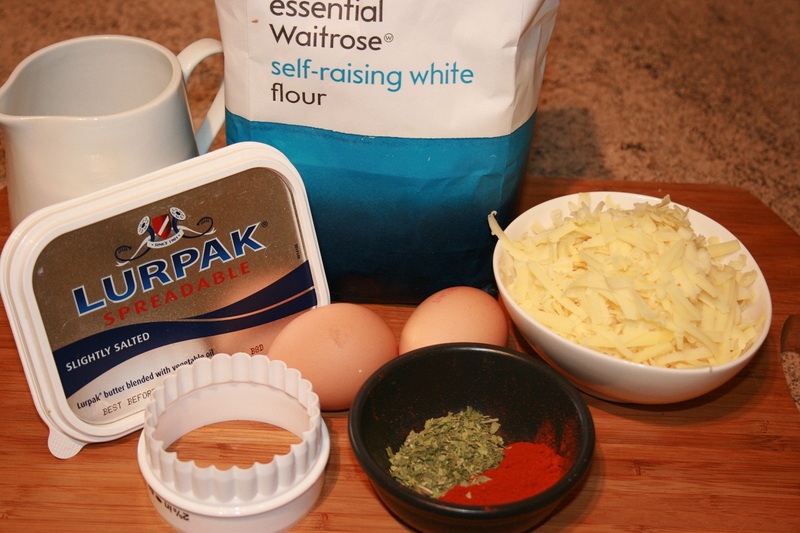 Beat ONE of the eggs and the milk together and then mix into the dry ingredients to form a sticky dough. 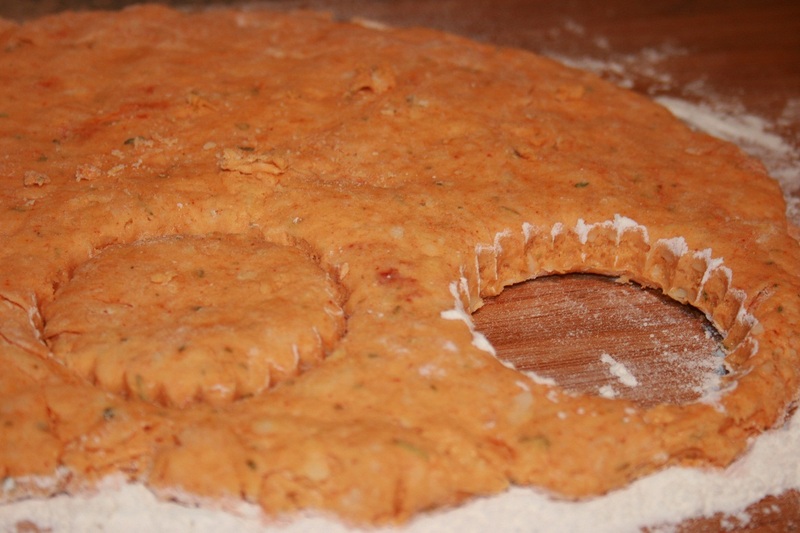 Place the dough on a well floured surface and flatten until about two and half centimetres thick. Then cut out rounds of dough. 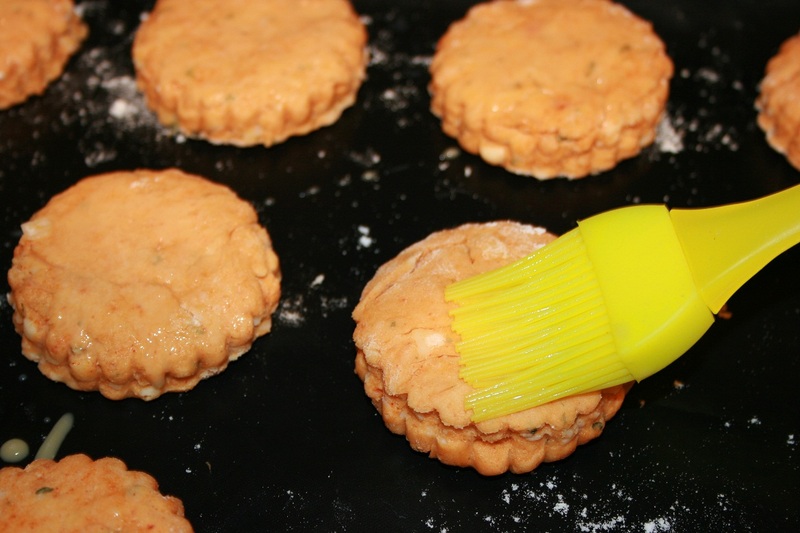 Place the scones on a baking tray and then beat the remaining egg and brush the tops of the scones with it. Place in the oven and bake for about 12-15 minutes until golden brown. 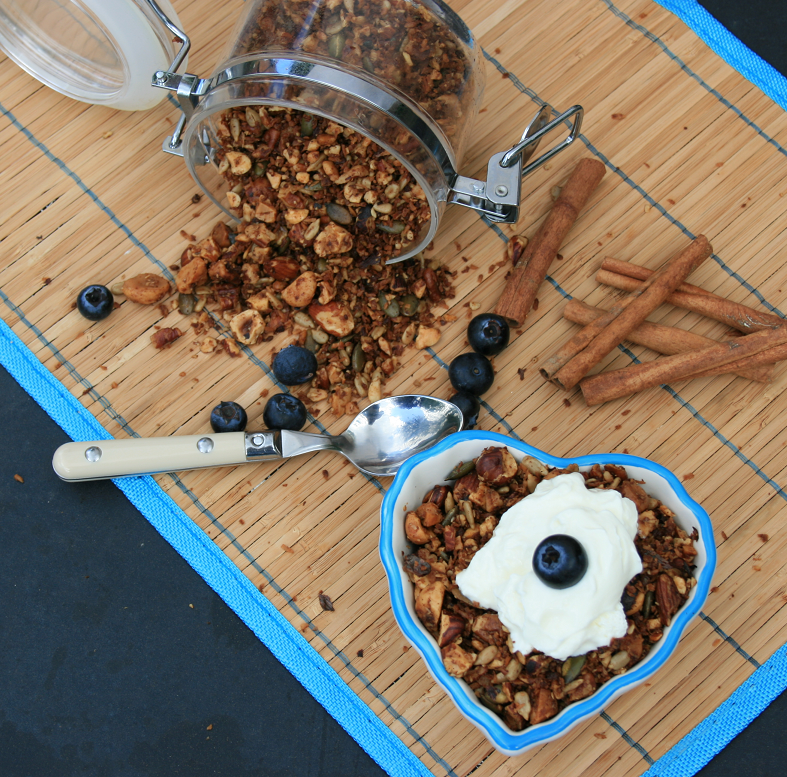 Serve with some fruit juice for a simple, awesomely tasty brunch! I’m sure by now you’ve realised just how much I adore brunch. Putting a proper cooked breakfast on the table shouts weekend, but I suppose because Monday to Friday it’s muesli, I like to show off experiment a lot more at the weekend. Unfortunately, I had to dash out the door early on Sunday morning, so there wasn’t much too much time to muck about in the kitchen, so it had to something quick and easy, but something that still yelled weekend. Weighing those up, it had to be French Toast. I had also been to a farmer’s market on the Saturday where I had foolishly bought my body weight in cherries. 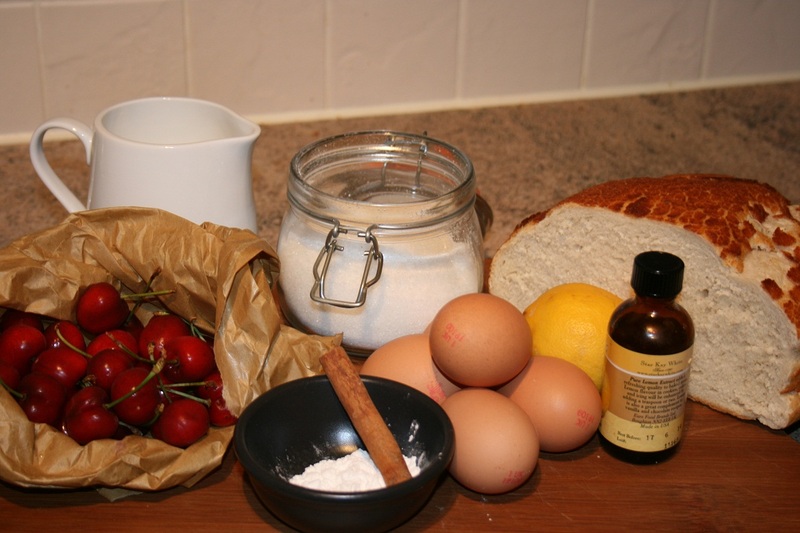 Now I LOVE cherries and when I have them in the house I find excuses reasons to put them in EVERYTHING. Now I suppose I could just have served them with the French toast, but that would hardly be blogworthy now would it? 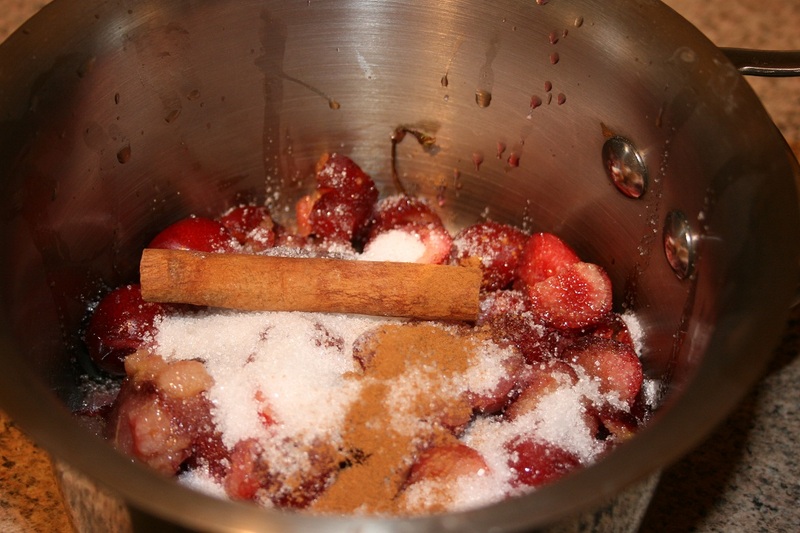 Pit and halve the cherries and add to a small sauce pan with the sugar and cinnamon. Add the corn flour to the water and mix thoroughly then add to the saucepan. Place on a medium heat and bring to the boil. Allow the sauce to reduce until thick and gorgeously syrupy. 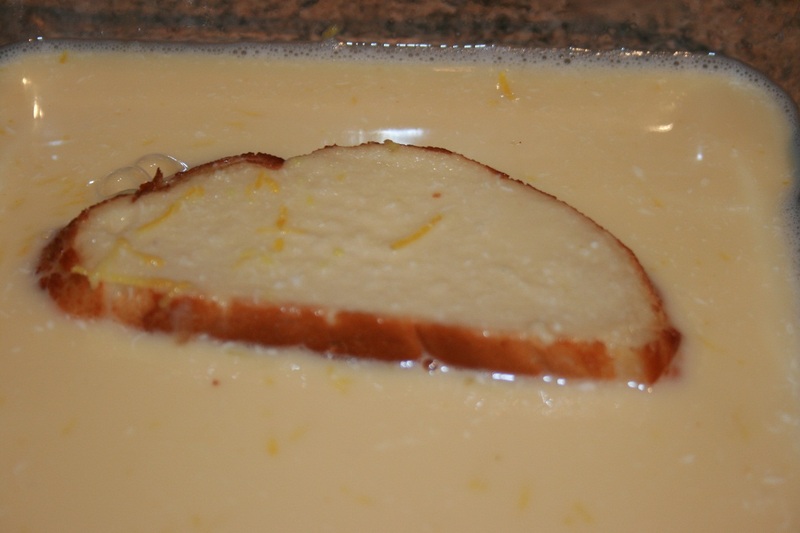 Slice the bread and then beat the eggs, milk, lemon essence and zest together in a large flat bottomed bowl. Heat a splash of oil in a frying pan and then dip the bread into the egg mixture allowing it to soak up some of the egg mix. 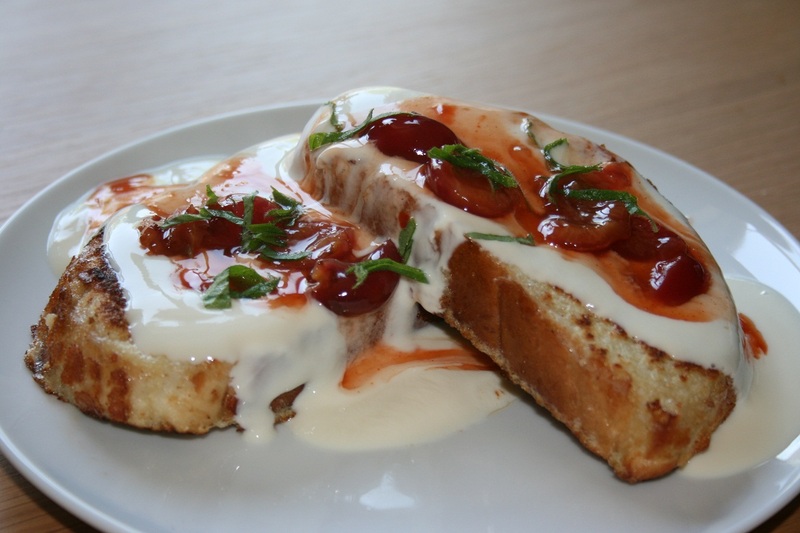 Fry the egg dipped bread in the oil until golden brown and delicious on both sides and then serve with the cherry sauce. 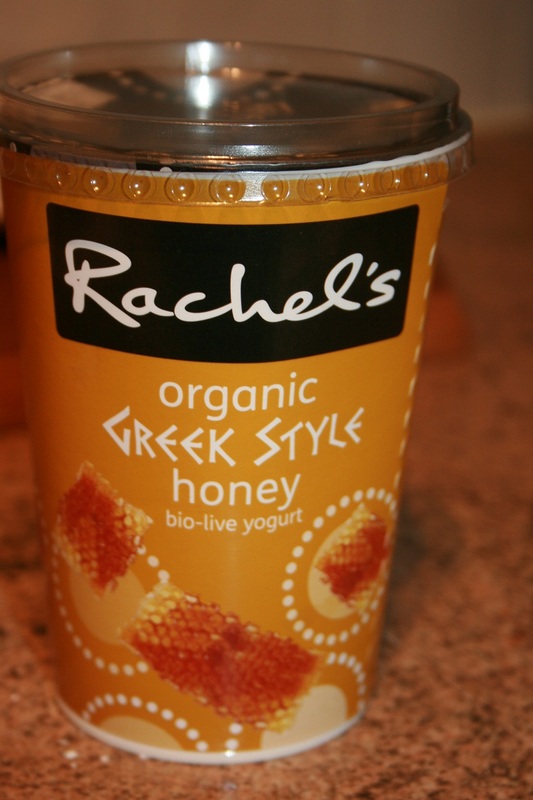 For added awesomeness, serve with some greek yoghurt or creme fraiche. My idea of heaven is to use this. There is something wonderfully decadent about weekend breakfasts. Especially when the day is grey and rainy and you have a full day of nothing to do stretching out in front of you. If you’re like me though, you’ve probably had your fill of full English fry ups. Don’t get me wrong, I love bacon just as much, if not more, than the next born again carnivore, but sometimes I want something a little less greasy. I also want something a little more satisfying and indulgent than muesli and this bread is the perfect balance between the two. 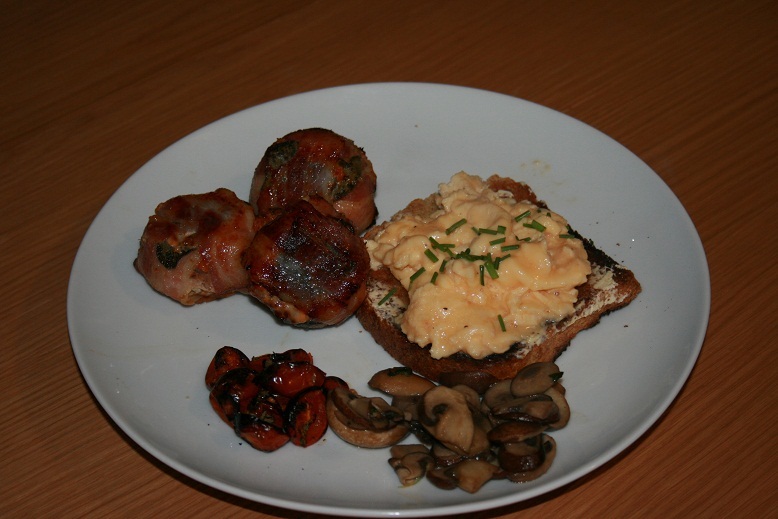 This is definitely a lazy morning breakfast, if you’re rushing to get somewhere it might not be the breakfast for you. It doesn’t require much work on your part, but it does need 40 minutes or so to rise and about 20 minutes to bake. 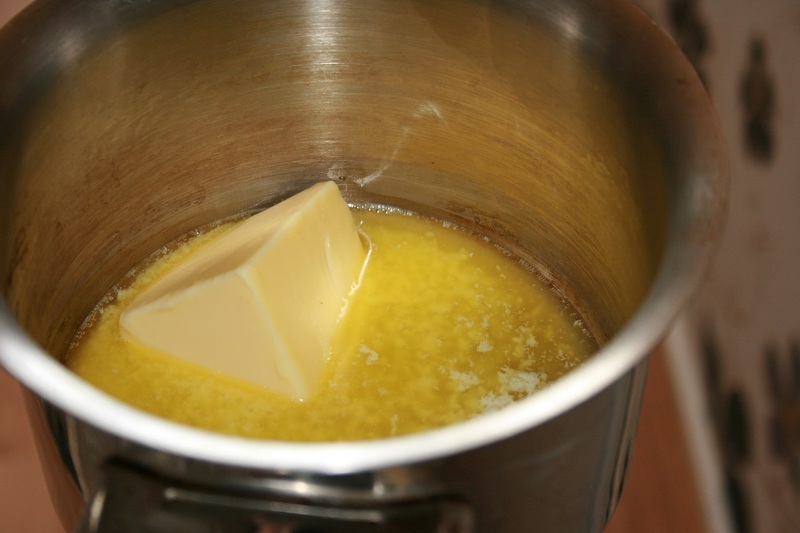 Melt the butter in a small saucepan and add the vanilla essence. 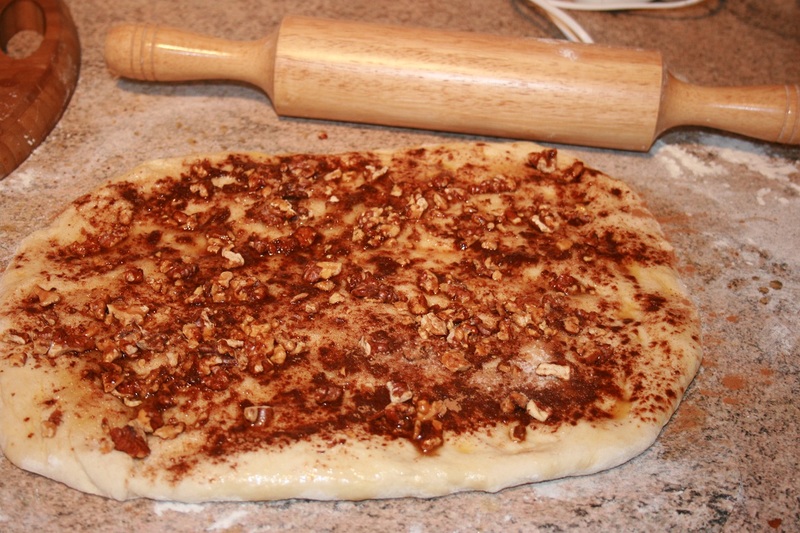 Roll the dough into a rough rectangle and then brush on the butter, leaving a space of about two centimeters on one of the long sides of the rectangle . 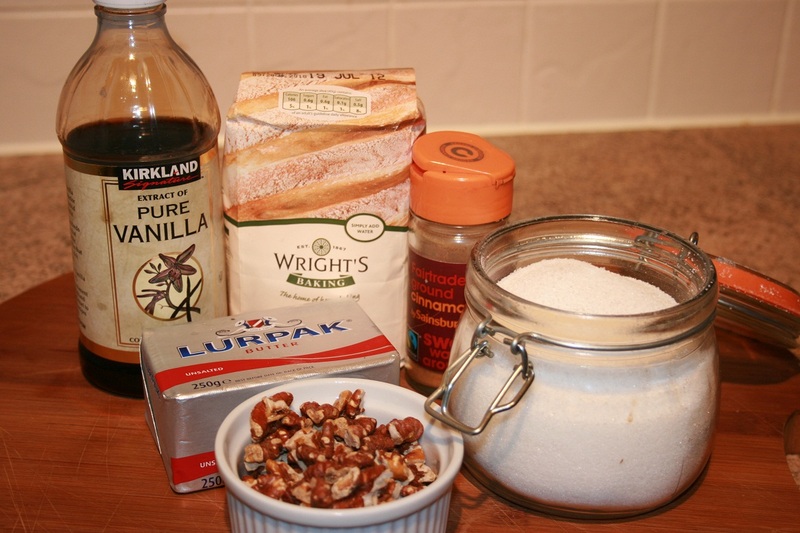 Sprinkle on the sugar, the cinnamon and the walnuts. 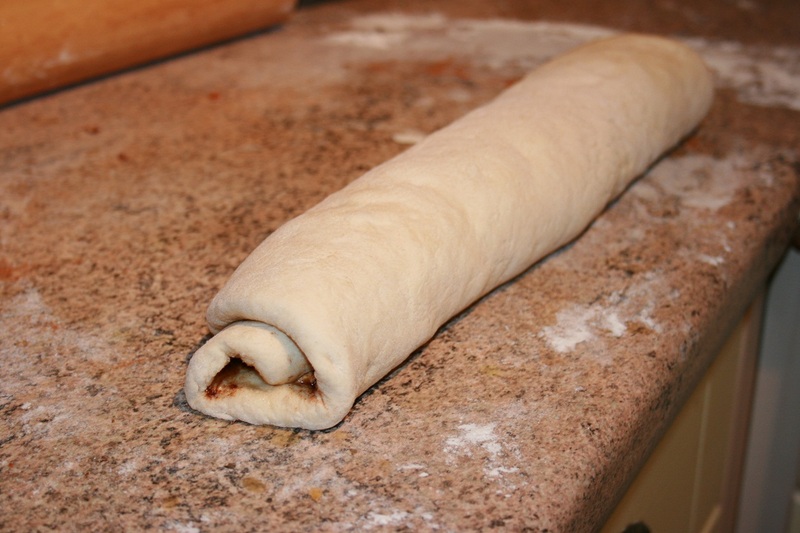 Then starting on the side where the butter is brushed to the edge, roll the dough into a long cigar shape finishing on the side where you left the space. Using a sharp knife dusted in flour cut the cigar into seven or eight equal pieces and place in a pie or spring form tin. 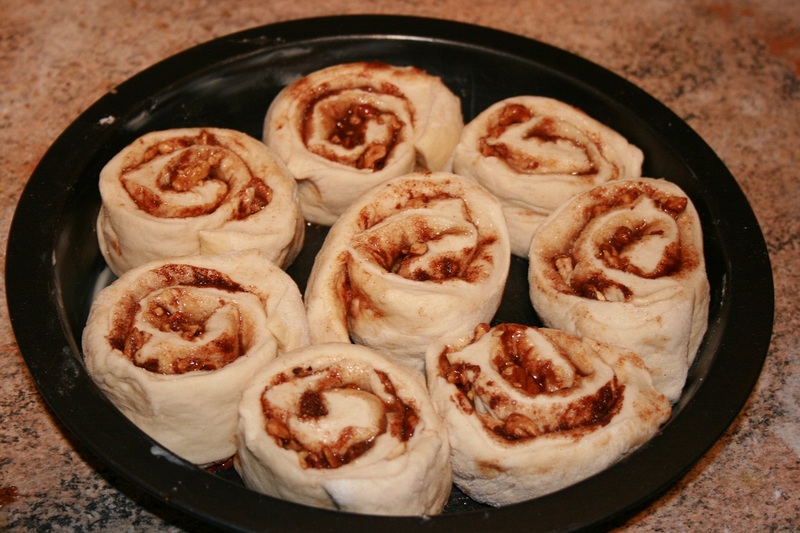 Cover the dough with a tea towel and leave in a warm place to rise for about 40 minutes. This is usually where I take the dog for a walk while the BH serenades me with sonorous snoring from the bedroom. Once the dough has doubled in size, preheat the oven to about 220ºC and bake the bread for about 20 minutes. 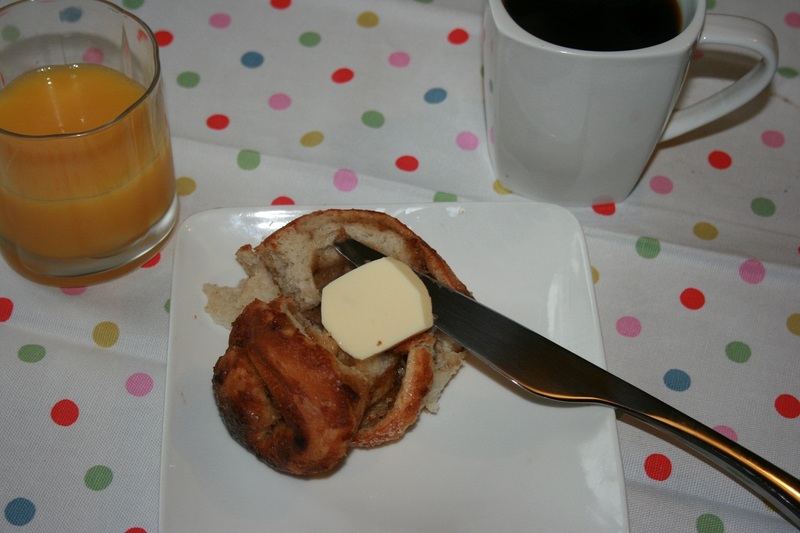 Once the bread is baked, leave to cool for about 10 minutes then tear off a hunk and serve hot with coffee and orange juice. 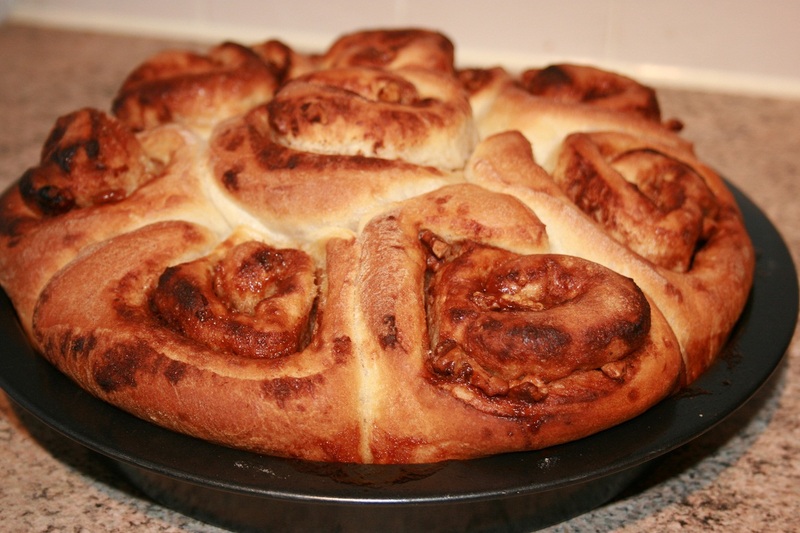 Now while breakfast is all very well this also makes a great alternative to dinner party rolls. It also works as side at a BBQ (Braai) and as tea bread. 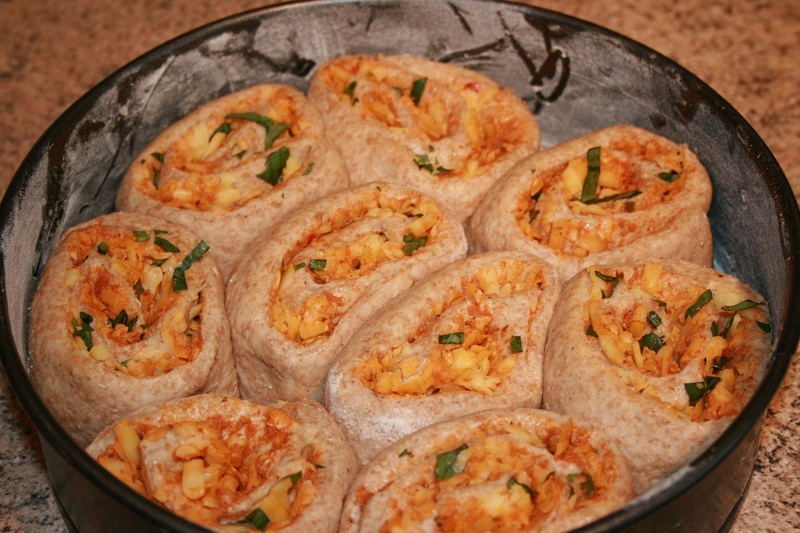 All you have to do is juggle up the dough you use and filling. 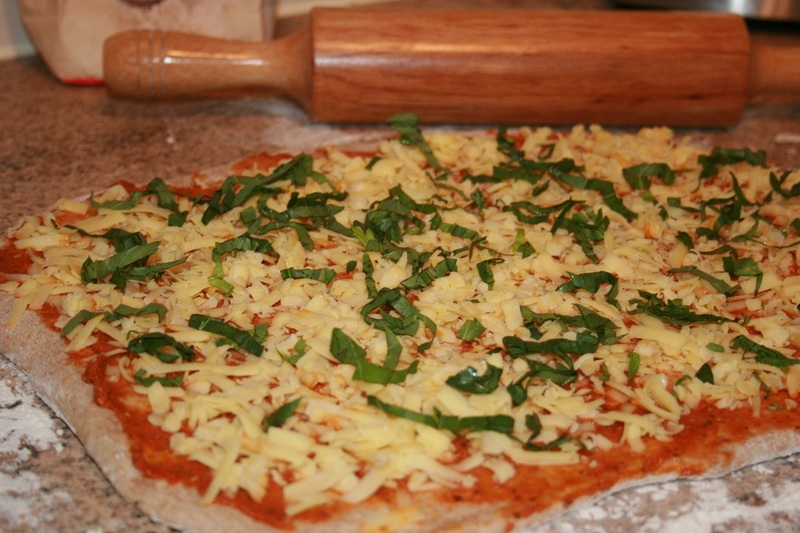 In this one, I spread a layer of sun-dried tomato pesto on wholemeal dough and topped it with cheese and fresh basil. On other occasions I peal, core and chop 2-3 apples and then soften them with some butter and vanilla essence in a saucepan on medium heat for about 10 mins and then puree. 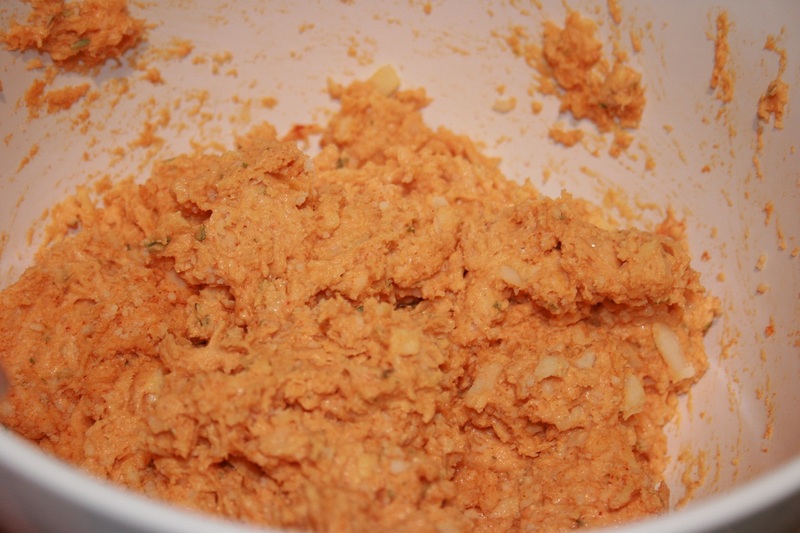 Spread this puree on the bread and sprinkle on some cinnamon. 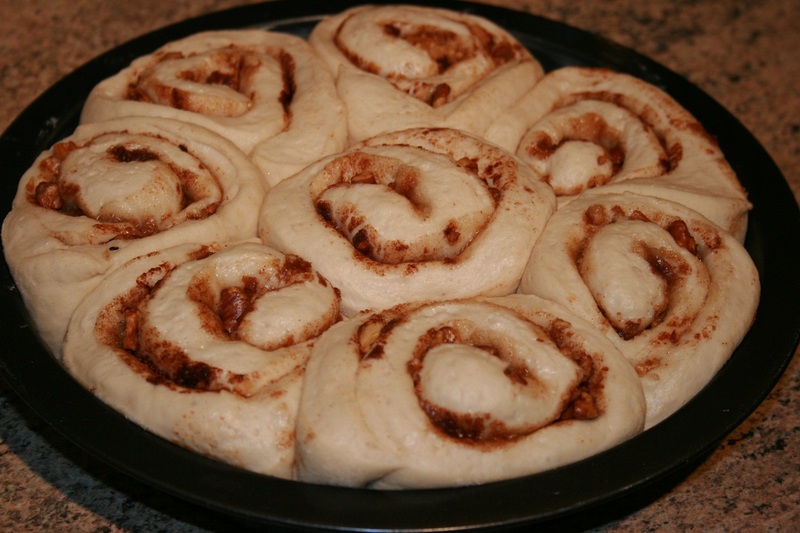 Sprinkle the top of the rolls with sugar before baking and enjoy. The possibilities are endless. There are lots of reasons not to start a food blog. It takes huge amounts of time. I don’t have picture perfect cooking equipment and I have a kitchen the size of a postage stamp. I am not now nor will I ever be a photographer. There are about a zillion other food bloggers out there who have all done a better job than I could ever hope to. I mean they’re real chefs or food stylists or BOTH! Did I mention how much time it takes? There are however a couple of reasons to start one though. The first being a love for cooking and coming up with new recipes and an incessant need to talk about food. The second being when your better half, or BH. tells you that if you don’t stop talking about food blogging and actually start doing it, he’s never going to talk to you again. And you love him all the more for it. So this it the outcome. 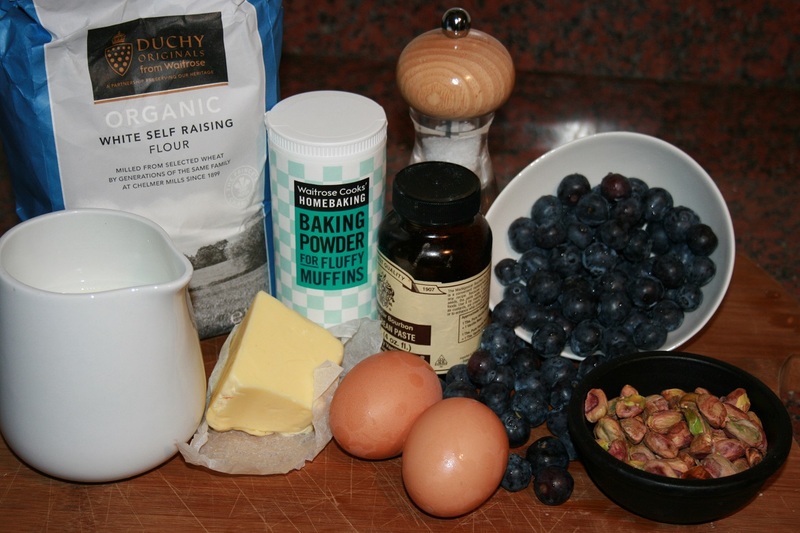 The first recipe we’re going to tackle is a new favourite of my BH. 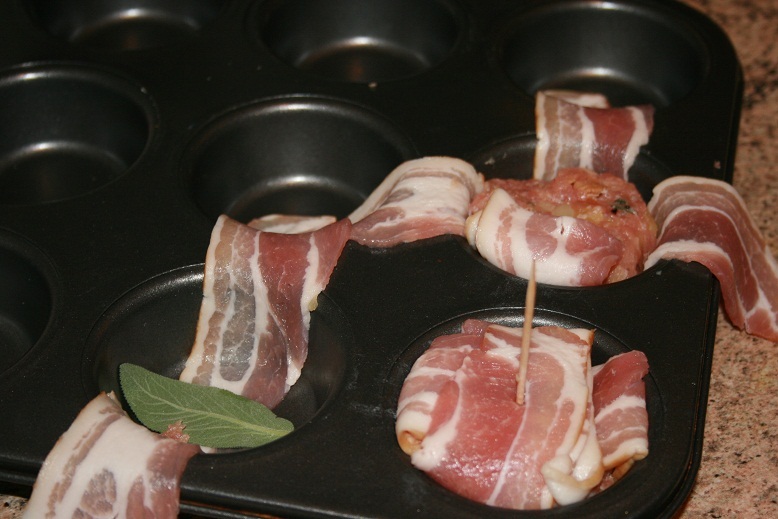 I like to call them caramelised apple, sage and pork stuffing balls lovingly wrapped in crisp salty bacon. He likes to call them Piggy Bites. 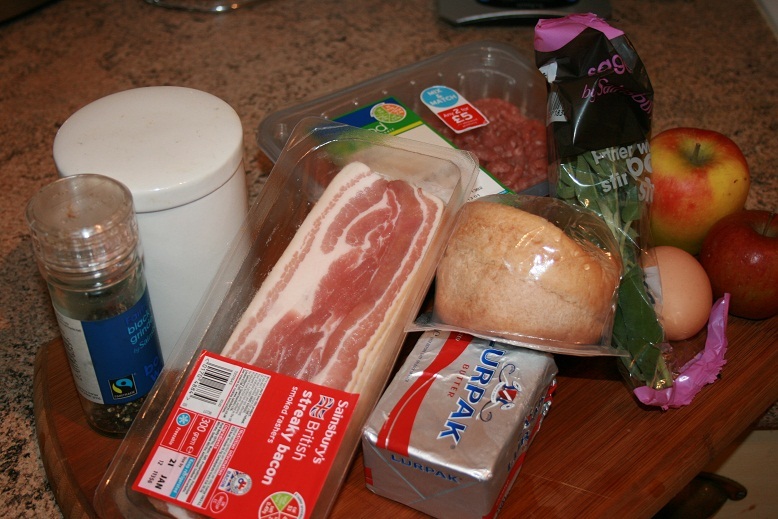 First up, the ingredients. These don’t have to be exact. The list below will make ten bites with left over filling. 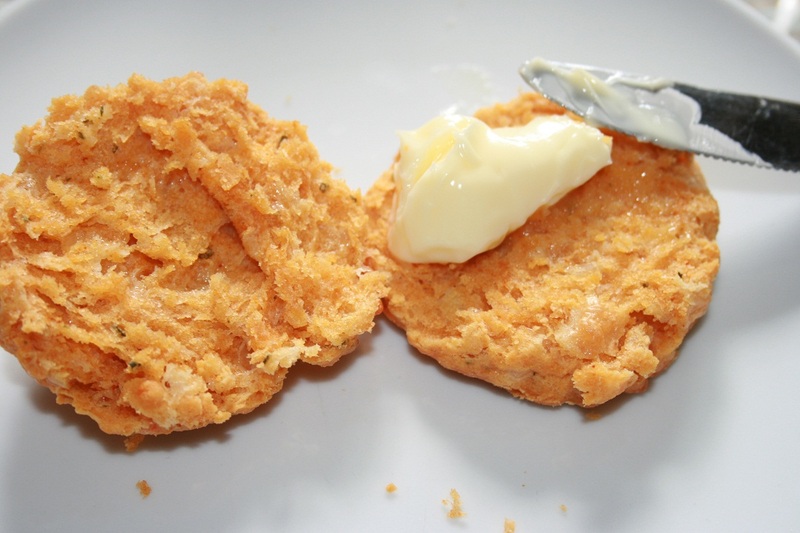 First you’re going to need to toast the bread crumbs until they’re lightly golden and crispy. They should resemble panko crumbs. 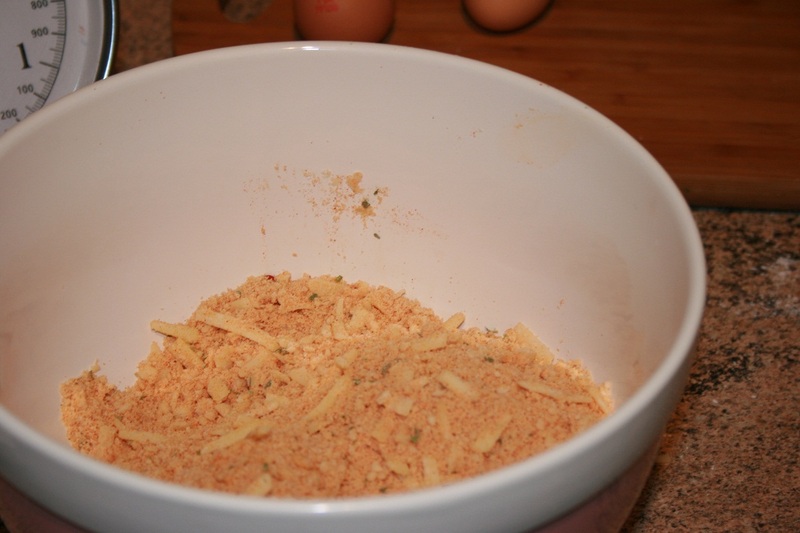 Alternatively just use panko crumbs. I toast the bread at 200°C and then leave the oven on so it’s ready to bake the bites. While these are toasting, peal and cut the apples into wedges. 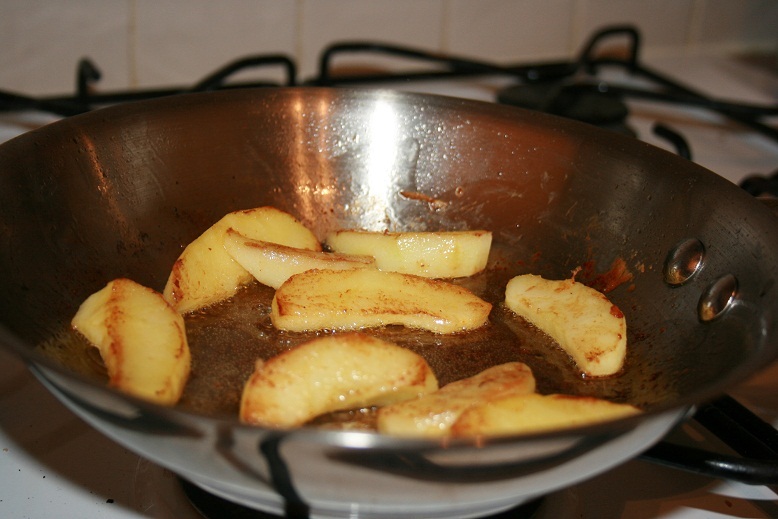 Then melt the butter in a small pan and caramelise the apples to sweeten and soften their flavour. They should land up looking something like this. Once the apples have cooled, chop them really finely or even process them into a puree, depending on your taste. Add the apples, pork, crumbs, egg, salt, pepper and the finely chopped sage into a bowl and get stuck in with both hands and mix. Then haul out your muffin tin and place a piece of bacon in one of the cups. Top the bacon with a sage leaf and then place another piece of bacon at a right angle on top of that. Make a small stuffing ball and place it on top of the bacon and then fold the over lapping bacon pieces over the stuffing. Secure with a cocktail stick. Something like this. Once you have ten muffin tin holes filled with bacon-ey goodness, pop the tin into the preheated oven and bake for 40 -45 mins. I tend to serve these for breakfast and this gives me enough time to get eggs scrambled, bread toasted juice squeezed and coffee percolated. Enjoy! P.S. They also work really well as a stuffing side for your Christmas/Thanksgiving turkey.